The mysterious Game of Thrones prophecy of Azor Ahai or the Prince (or Princess) That Was Promised has got everyone guessing. One Reddit user has explained a very gripping theory of who Westeros’ saviour and ‘bring the dawn’. The theorist puts the heroic crown on the head of Daenerys Targaryen, making links between the locations of her failures and pointing out the subtle symbolism of her first failure being in water, and Casterly Rock as the ‘heart of a lion’. I think that last episode basically confirms who Azor Ahai is…and it has everything to do with the forging of ‘Lightbringer’. In the books, the legend states that Azor Ahai was working to forge a hero’s sword. On his first attempt, he tried to temper the steel in water, but it shattered. On his second attempt, he tried to temper the steel by thrusting the sword into the heart of a lion, but it too shattered. On the third and final attempt, he thrust the sword into his wife’s heart, and became successful in creating his sword Lightbringer. In Episode 2 of this season, we got the extremely heavy-handed “prince or princess that was promised” Valyrian grammar lesson, which was enough for some viewers to become convinced that Daenerys is Azor Ahai. I was not convinced. Let’s look at the two battles that involved Daenerys’ armies in each episode the past two weeks. The first, Yara/Dorne vs. Euron’s naval battle. 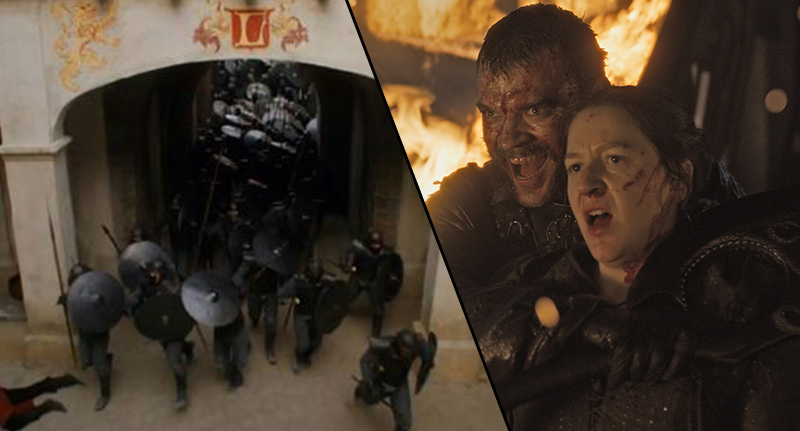 Euron crushed their forces, taking their ships as well as Yara, Ellaria, and Tyene as prisoners. This attempt was a failure for Daenerys. The second, Unsullied vs. Casterly Rock. While Daenerys comes out with a victory in the battle itself, Cersei outsmarts her here. Only a fraction of the Lannister army is defeated, and Euron burned her fleet. The Unsullied have to march across Westeros to return to Dragonstone, where Lannister forces will most likely be waiting for them. Another failure for Daenerys. If these battles represent any sort of pattern, it is pointing to the fact that Daenerys Targaryen is Azor Ahai. We don’t know yet who will be standing in for the third part of the prophecy, Azor Ahai’s lover, but I’d be willing to guess that it is Jorah Mormont. He’s been cured of grayscale, and is heading back to Daenerys, it seems logical. The only thing I’m still unsure of is what or who exactly Lightbringer will be for Daenerys. It seems to be some sort of army, maybe involving dragons, but who knows. The original prophecy mentions a ‘Prince’, but has we have learned from Game of Thrones, you can not take prophecies at face value. The signs are pointing at the Mother of Dragons as the legendary hero, but it wouldn’t be the first time the programme threw us a red herring.